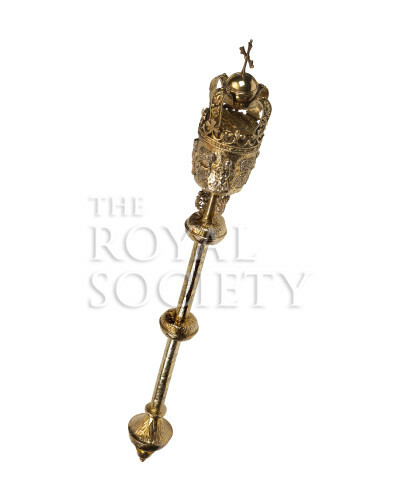 The silver-gilt mace was a gift from King Charles II in 1663. It is decorated with a running pattern of roses and thistles on the stem, and the embossed figures of a rose, harp, thistle and fleur-de-lys on the head, emblematic of England, Ireland, Scotland and France. The letters 'C.R.' denote Charles II, and an inscription on a shield at the base describes Charles as the Society's 'founder and patron'.